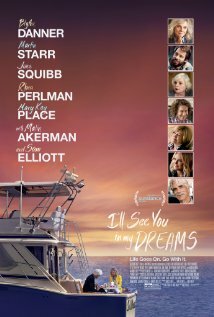 Bleecker Street releases I'll See You in My Dreams at Angelika Film Center and AMC/Loews Lincoln Square on May 15th, 2015. NYC MOVIE GURU: How challenging and important was it to ground the film in humanism? Brett Haley: It's very challenging. You're walking a thin line when trying to make a piece of entertainment. I was trying to say something honest and real about people while also trying to be entertaining and funny. It's a hard balance, but it's very important to me. It's of the utmost importance to be authentic at all times. My goal with this film was to create a world in which the audience thought as reality and think about all the issues that we all go through emotionally, but also to be entertained. NYC MOVIE GURU: Where does your good ear for natural dialogue come from as a writer? BH: It comes from a place of observation of how people actually talk in the world. When was writing with the co-writer, Marc Basch, we were saying the dialogue out loud and making sure that it sounds like how people talk. It's important to me, and I just try to write the way that I hear people. It comes from observation, but also a lot of practice. I've been writing a long time and trying to get this down, so if I've done it well, then I think that practice makes it perfect as well. NYC MOVIE GURU: How did you restrain yourself from veering into over-the-top comedy and schmaltz? BH: I definitely don't want to audience to be taken out of the general story. I don't want them to be on the journey and then something goofy happens tonally or something extremely melodramatic. We were very aware while writing, shooting and editing that we needed to cut anything that felt forced. It's very important to me that the film never feel forced. It's something that I'm extremely conscious of and what I look for when I go to the movies. This movie does walk a thin line, I think of being a polished piece of entertainment while being a human story. Tone is so crucial to a film like this. I didn't want it to go too far one way or the other. If we would've made some cheap jokes or laughs, people wouldn't enjoy the film as much. NYC MOVIE GURU: How challenging was it to deal with the use of symbolisms without being heavy-handed about it? NYC MOVIE GURU: As a director, how do you detect charisma during the casting process? BH: I think you can get a sense of who people are from their previous work. On this film, everyone was my first choice for the role. It was very important that the casting be perfect. If the casting wouldn't work then the movie wouldn't work. I was taking risk because it's a low budget film, but I felt confident for sure from their previous work that they they would be able to bring their charm, charisma and naturalism to each role. NYC MOVIE GURU: How would you define the word "grown-up"? BH: "Grown-up" is another word for "mature." It's not a grown up movie, per se. It's subtle, honest and authentic. People are surprised that a 30-year-old guy made it which is probably why it gets associated with the word "grown-up" or "mature" because I'm young and directed it. It can be a film for people of many ages because I think it really talks about things that everyone can relate to. NYC MOVIE GURU: How do you feel about the way that Hollywood depicts old people?? BH: Generally, they're treated as secondary to the plot. They're the grandmother, grandfather or crazy uncle. Sometimes when they are leads in a film, they're sort of cliched and prone to broad strokes and play off of the humor of being old. I didn't want to do that. I wanted to make three-dimensional characters who happen to be older and try to get under their skin to find out who they are. I also felt that the younger characters have that same quality of being three-dimensional and being more than just plot-drivers. Hollywood is getting better about it, but it has a long way to go. Hopefully, this film adds to the conversation so that films that do have older characters would not be side players or plot movers. NYC MOVIE GURU: Do you think the inscription at the end of It's a Wonderful Life, "No one is a failure who has friends," is an apt way of summarizing the message of I'll See You in My Dreams? BH: Absolutely. I think that's a wonderful connection you've made there. The film is really about the various connections that we have with people and pets--things that we love in this world. The crucial connection within this film is with Lloyd, [the pool guy]. The connection that Carol has with everyone in this film from her friends to her daughter, at the end of this journey, that's what we have. We look back and remember the connections we've had with each other. That is obviously part of friendship. All relationships that are close are part of friendship. They have to operate that way. It's an important part of living in this world. NYC MOVIE GURU: Who are some actors or actresses from the Golden Age of American Cinema that would be great for the roles in I'll See You in My Dreams? What film would make a great double feature? BH: I love Gary Cooper and Humphrey Bogart. They could have had good roles to play here. Katharine Hepburn would've been great as Carol because her and Blythe share that witty, no-nonsense about them. They cut right through it and get to the point. Carol is that way too. A good double feature for this would be Mad Mad: Fury Road. Go see them both this weekend! You can go have the ride of your life with Mad Max and then come down to reality with I'll See You in My Dreams.